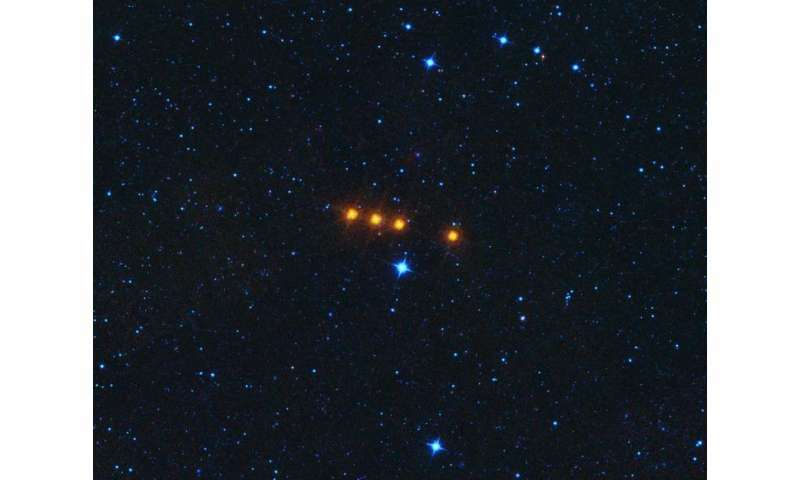 Distributed at the outer edge of the asteroid belt, the Euphrosynes have an unusual orbital path that juts well above the ecliptic, the equator of the solar system. The asteroid after which they are named, Euphrosyne—for an ancient Greek goddess of mirth—is about 156 miles (260 kilometers) across and is one of the 10 largest asteroids in the main belt. Current-day Euphrosyne is thought to be a remnant of a massive collision about 700 million years ago that formed the family of smaller asteroids bearing its name. Scientists think this event was one of the last great collisions in the solar system. NEOs are bodies whose orbits around the sun approach the orbit of Earth; this population is short-lived on astronomical timescales and is fed by other reservoirs of bodies in our solar system. As they orbit the sun, NEOs can occasionally have close approaches to Earth. For this reason alone—the safety of our home planet—the study of such objects is important. There are over 700,000 asteroidal bodies currently known in the main belt that range in size from large boulders to about 60 percent of the diameter of Earth's moon, with many yet to be discovered. Although I would enjoy the discovery of a new dwarf planet in the main belt! Still the very strange numbers in question in the present article intrigued me; WTF was he talking about exactly. Eris is as big as Pluto (60% the diameter of the Moon). All dwarf planets are on the minor planet list except Pluto; the odd one out again. In conclusion the error is not in the numbers but in a set of words that are out of place: "in the main belt". And that seems to be the best way to address DC Agle failed paragraph. Well done! Thank you JAG! This was team work and a demonstration of a good vetting process. Did you get that DC Agle?